This is a story of a young boy called Jack whose Grandpa has become confused in his old age. 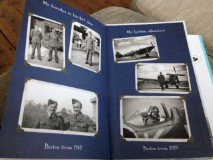 He believes he is back in World War II saving the skies as an RAF Spitfire pilot. Only Jack understands him and sets out to rescue him from a fate worse than life at the cruel and crooked old people’s home ‘Twilight Towers.’ Their escape is magical and daft and their one last adventure going “up, up and away” is the stuff of most kids’ dreams. 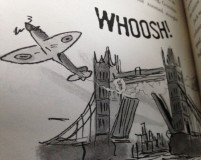 This is such a funny story wonderfully illustrated by Horrid Henry artist Tony Ross’ Quentin Blake-esque drawings of hairy nurses with “love and hate” knuckle tattoos and of Grandpa clambering out of the Spitfire at the Imperial War Museum. It’s also touching, dealing with the plight of today’s elderly and with a little boy’s grief for his most-loved relative. It’s witty and gross and packed with laughs and gasps. If you want your kids to love books, read them this, there is no better place to start. Hopefully, these novels will then live on in their hearts as Dahl’s The BFG and Charlie and The Chocolate Factory have in the hearts of my generation.